Our Hybrid-Homeschool program is in it's second year, and growing! CLCS is offering a one day per week Hybrid-Homeschool option. This allows homeschoolers in our area to experience a larger school setting while still being in a safe, nurturing environment. Bible This class is taught topically, with a scripture lesson and application included. We strive to make our Bible times relevant and engaging for the students. Our school uses the English Standard Version (ESV) Bible. Music Melody Zimmerman teaches music to grades 3-8. Students learn basic vocal and instrumentals skills, as well as beginning music theory. This teaches them confidence as they learn to work corporately to, “worship the Lord with gladness; come before him with joyful songs.” (Psalm 100:2 NIV) For the younger children (grades PreK -2), music class is taught by Gail Felker. Class is age-appropriate and less structured, and introduces early music concepts through rhythm, vocal and movement techniques. Physical Education Younger students receive developmentally appropriate instruction in skill development and fitness activities. This class includes body, spatial and movement awareness. Games and fun activities are an integral part of each class period. Older students engage in skill development and have the opportunity to play team games in class. They also prepare for the Presidential Fitness Test in May. Library Students may check out books from our school library. We have a large, carefully chosen and curated selection of books and other media. If the schedule permits, students also enjoy a read-aloud selection and learn library skills. Art is a project-based, multimedia program providing students the opportunity to work with many different materials and techniques. Our art teacher, Kathy Mead, is both skilled and creative, and brings out the best in each of the students. Spanish is a language exposure/culture class, taught by Tonika Jones, using age-appropriate curriculum. Younger students begin by learning basic vocabulary (greetings, alphabet, colors, numbers, etc.). Hybrid-Homeschool students in the upper grades are taught more challenging subject matter at an introductory level. Spanish tutoring may be available outside of the classroom. 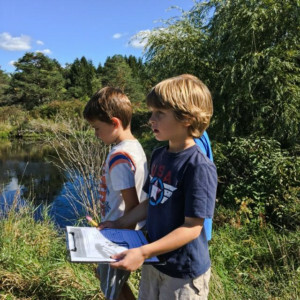 Environmental Education We are excited to include Hybrid-homeschool students in our Environmental Education studies! CLCS is located on 100 acres of reclaimed farmland. During EE, students and teachers have access to the property’s wetlands, fields, pond, streams, old orchards, and forests. We find that this is the perfect environment for Place-based education. The students are taught through the lens of sustainability, and Environmental Education is integrated across the curriculum. As a Christian school, we hope to cultivate a sense of joy and wonder for the world around us within the Christian framework; stewarding God’s beautiful earth in respectful and thoughtful ways, and preserving it for future generations. This year we are focusing on the Big Ideas of Cycles and Community, and thinking about these ideas as we observe, ask questions, and come up with answers to real-life problems. What is the cut-off date for applying? There is no registration deadline, and space availability is on a first-come, first served basis. What ages/grades are included in the Hybrid-Homeschool? The Hybrid-Homeschool program is available for Pre-Kindergarten through 8th grade. How are tuition payments handled? One-time payments can be made directly to the school. We also collect bi-annual and monthly tuition payments through FACTS Management, an online service that handles the tuition of over 12,000 schools and colleges. There is a $50 fee to sign up for the monthly payments through FACTS Management. To learn more, go to the “visit FACTS website’. Each child needs inside shoes, P.E. sneakers, waterproof boots for Environmental Education, and an additional pair of outdoor shoes for recess and other outdoor activities A complete change of clothing, labeled with student’s name, must be kept at school (shirt, pants, socks, underwear). Required school supplies are listed on the Student Supply list. The office provides a sturdy folder for each child, used for communication between school and home. Students bring a bag lunch, and small snack on Wednesdays. If interested, Hybrid-Homeschool students can order a pizza lunch on Wednesday instead of bringing lunch. The pizza lunch includes plain or pepperoni pizza, juice/milk, fruit/vegetable and dessert. The order form and payment options are available online at PraxiSchool. Our pizza lunch is run by the 8th graders, and raises money for the annual 8th grade trip to Virginia Beach. Microwaves are available for heat-ups. Yes, we have an After School Program. We offer care from 3:00 – 5:30 each full school day. Please go to Forms and Financial Information and click on the After School & General Forms tab for more information.